The wizarding world of Harry Potter is loved by generations across the globe. 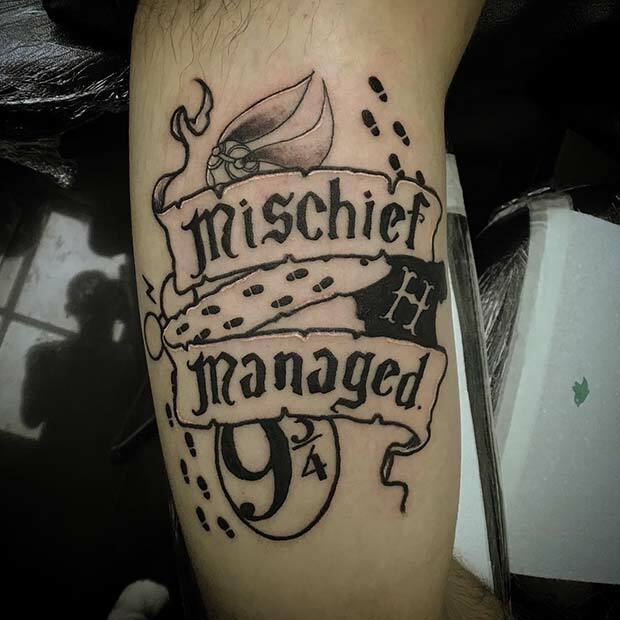 So, it is no surprise that the books and movies have inspired tattoos. 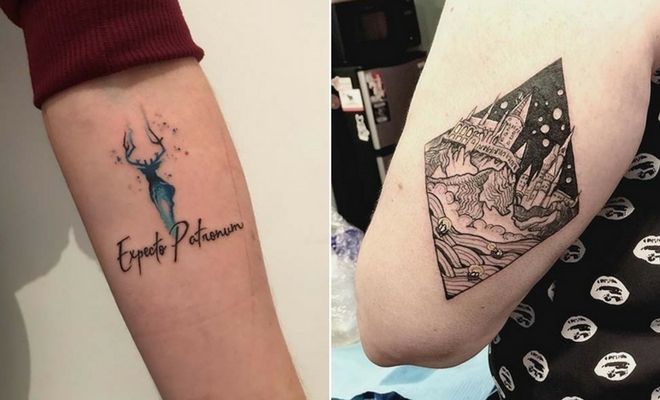 If you are thinking about getting a magical piece of body art, you need to check out our 23 cool Harry Potter tattoos. We have something for every fan from including quotes, spells and more. Take a look to find you favourite we love them all! 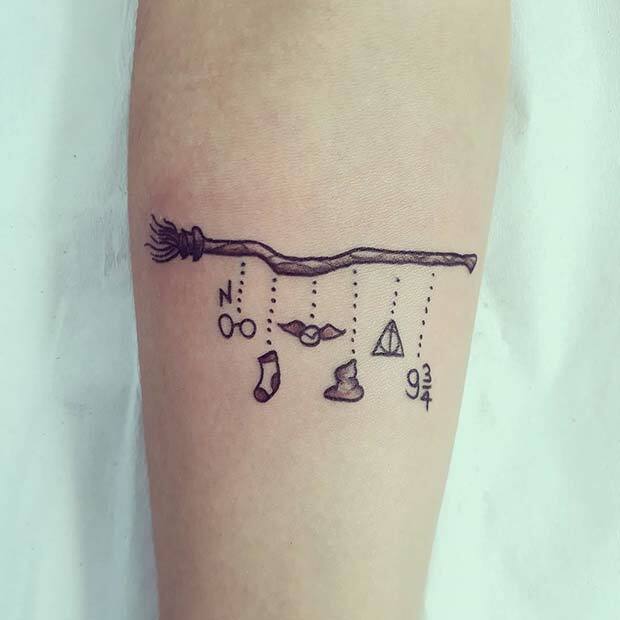 First up we have this super cute Harry Potter theme tattoo. The art features a broomstick with little designs dangling from it. Each small tattoo features an iconic image from the movies and books. We can see the Golden Snitch, the Deathly Hallows symbol and more. You could recreate a tattoo like this with your favourite pieces and include things you love. 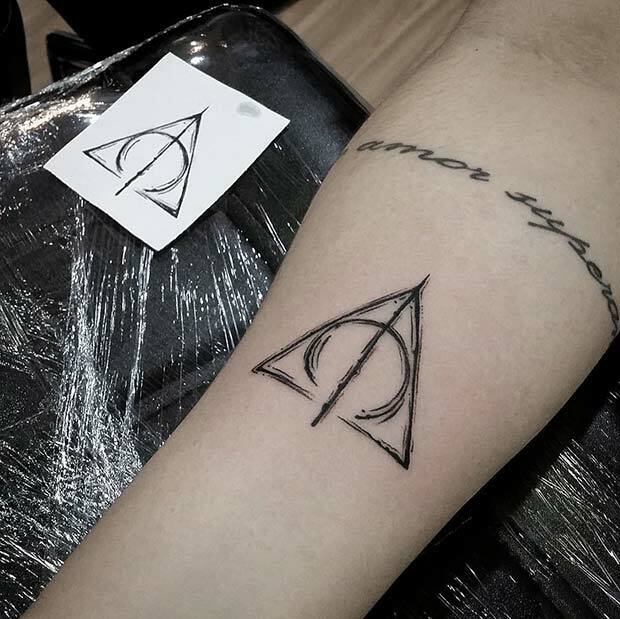 The symbol of the Deathly Hallows is iconic, majority of fans know this design as soon as they see it. This next tattoo idea features a small black ink Deathly Hallows symbol. We think this idea is very cool as when other HP fans see it they will know you are a fan to. You could have something like this placed almost anywhere on the body, it would make a great first tattoo. 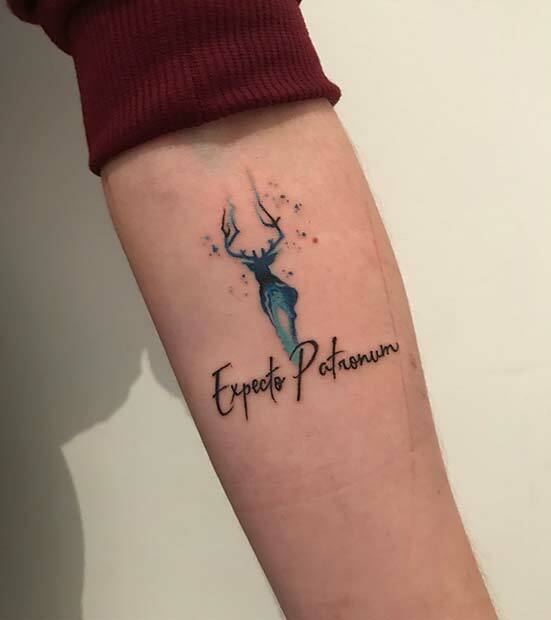 Next, we have a beautiful tattoo design that features the spell Expecto Patronum. This charm is a fan favourite because each animal that appears is different to each person. This art has the stag which is Harry Potter’s animal. You could recreate something like this or have fun take a quiz and have your very own animal created. Any fan of the Harry Potter will know all about Polyjuice Potion! 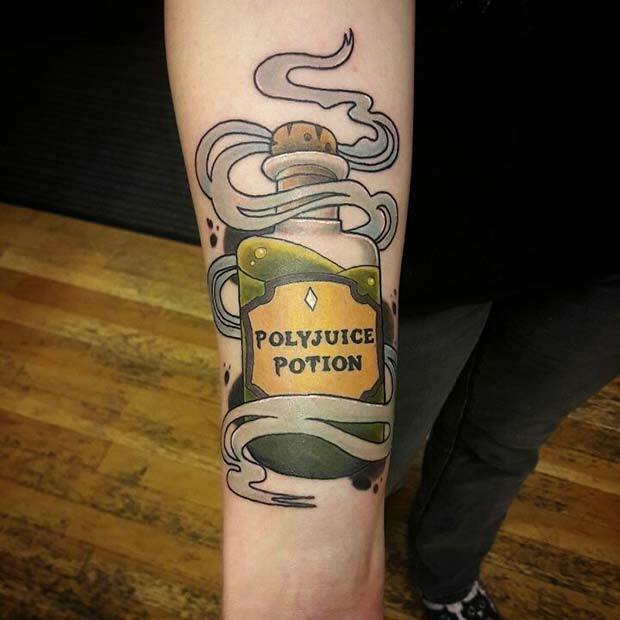 This design idea features a cool tattoo version of the famous potion. You could have a unique tattoo like this recreated larger or smaller and have it placed almost anywhere on the body. Our next tattoo idea is an awesome piece of artwork that uses various Harry Potter themes. You have mischief managed from the Marauder’s Map, the Golden Snitch, Harry Potter’s glasses and scar, platform 9 ¾ sign and a H for Hogwarts. We love this tattoo because it uses designs from across the series. Platform 9 ¾ is the gateway to Hogwarts. This tattoo design features the numbers of the platform with subtle HP themes. We can see the Deathly Hallows symbol and a little lightning bolt. This is such a cute tattoo, you could have a similar design but smaller and place it elsewhere on the body. The wrist would be a great choice. 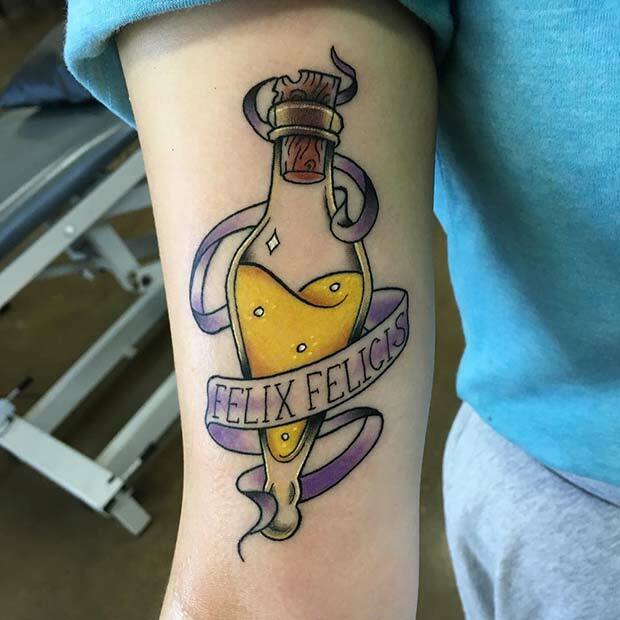 Bring yourself some luck with a Felix Felicis tattoo. Felix Felicis or Liquid Luck is a potion that brings whoever drinks it luck and success for a limited time. We know you cannot drink it, but the tattoo makes a great good luck charm. We love this quirky idea! Dobby the House Elf is one of the most loved characters of the series. Our next idea features a small black ink portrait of him with the words freedom underneath and a lightning bolt in the background. 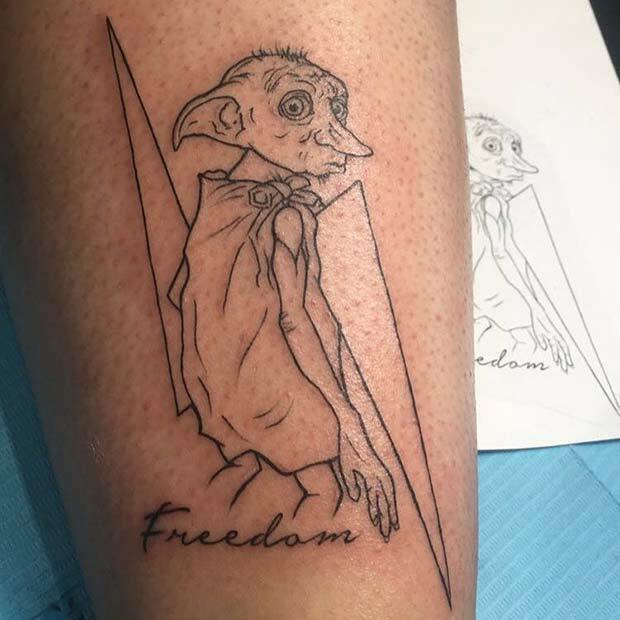 This tattoo is perfect for the fans who consider Dobby their favourite character. You could recreate this in different ways to. One of the most iconic scenes in the movies is when we see Hogwarts for the first time. Our next tattoo captures this magical moment and makes it into stunning body art. 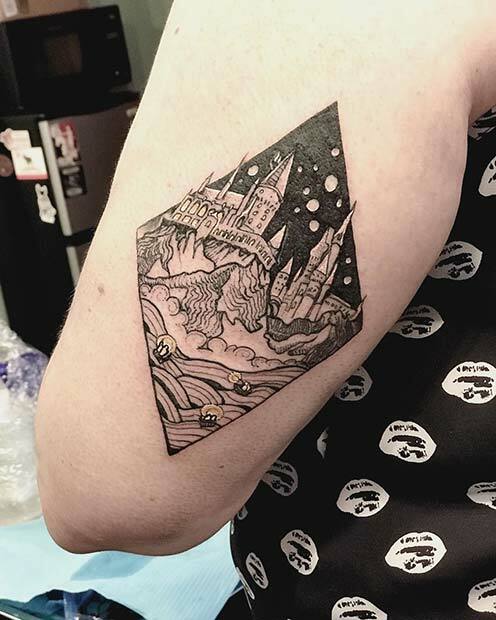 This black ink tattoo features an intricate design of Hogwarts and you can even see the little boats sailing towards the school. We love this awesome ink! As many will know the magical Phoenix Fawkes is Dumbledore’s loyal friend. 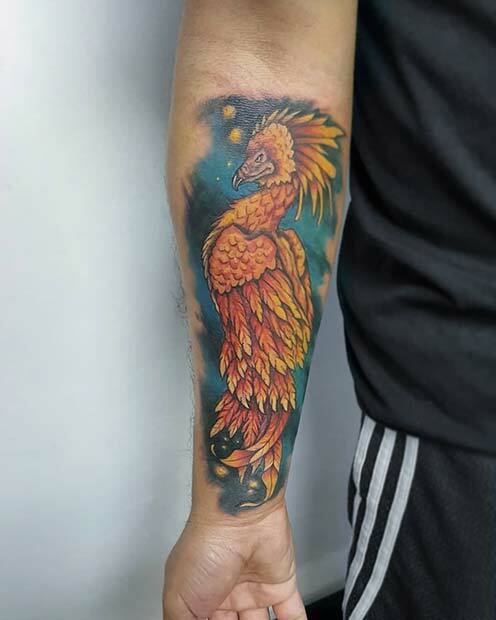 Next on our list is this stunning Phoenix tattoo idea. The detail and colors used in this design are beautiful. 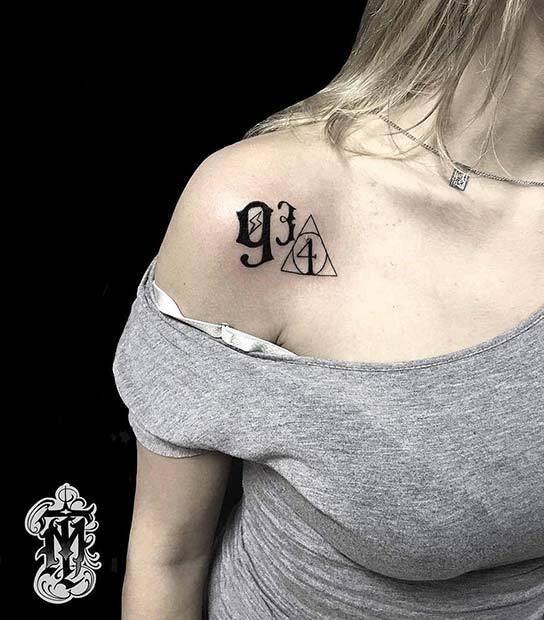 A tattoo like this will wow the HP fans but also the people who aren’t. This tattoo represents the series but is a great tattoo on its own to.